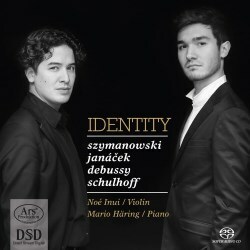 It’s an interesting concept and an imaginative and well-constructed programme that Noé Inui and Mario Häring present. Nationalism in music emerged in the 19th century alongside burgeoning political independence movements. In politics, the struggle for self-assertion came to a head with World War 1. Correspondingly, in music the search for a national identity manifested itself with the break-up of tonality and liberation from formal conventions. The sonatas which emerged during the first part of the 20th Century were characteristically heterogeneous, with an emphasis on national musical elements such as the use of folk songs, folk dances or rhythms. The music chosen for this release was composed between 1904 and 1927. It focuses on European composers, who were searching for their own musical identity, freeing themselves from the shackles of tradition, and giving free rein to their imaginations. Dating from 1904 when the composer was only twenty-two, the Szymanowski Sonata is the earliest work here. In it the composer keeps his feet firmly planted in late romanticism. It’s a work that offers the players plenty to luxuriate in, with its lush textures and harmonies, but Inui and Häring are never tempted go overboard. I particularly like the way they negotiate the jaunty pizzicato scherzo in the middle of the second movement, and then gently ease the listener back into the passionately romantic theme. Inui’s rich, warm tone, with its myriad tonal shadings and hues, is put to good use in the composer’s Nocturne and Tarantella, Op. 28 from 1915; the impressionistic textures call for a player with a broad colouristic range. Häring achieves some diaphanous pianistic effects to support the violin in the Nocturne. The Tarantella is delivered with vitality, energy and panache, with left-hand pizzicatos, double-stops and other violinistic effects. In 1915 Debussy started a project to compose six sonatas for various instruments. Sadly ill health prevented completion with the exception of three of them: the Sonata for Flute, Viola and Harp, the Sonata for Cello and Piano, and the Sonata for Violin and Piano, the last to be completed a year before his death. This is perhaps the best known work on this disc, and enters a field with plenty of competition. It stands up well. It’s a performance with a purposeful sense of direction and great personality. Throughout there’s sensitive control of dynamics, instinctive phrasing and, most of all, an underlying freshness and spontaneity. It is comparable to the best versions available. The only work I’m not familiar with is the Violin Sonata No. 2 by Erwin Schulhoff. Having received early encouragement from Dvořák, he entered the Prague Conservatory at the age of only ten. He later studied composition with Max Reger in Leipzig. During World War 1 he spent some time as a répétiteur under Otto Klemperer at the opera house in Cologne. Later in 1941, as a Czech Jew, he was arrested by the Nazis and incarcerated at Wülzburg concentration camp, where he died in 1942. The Second Violin Sonata dates from 1927. The work has an impetuous opening, and this spiky, angular theme returns at the beginning of the finale. These two movements bookend a sedate and introspective Andante and a short Burlesca. In this technically complex work, the duo rise to the challenge admirably with unbounded virtuosity. There’s a tangible rapport between the players, which enables them to achieve their vision of this richly inventive score. The Janáček Violin Sonata underwent a lengthy gestation process. Begun in 1914, it was not published until 1922, and then only after several revisions. The opening movement has a rawness and intensity, suitably conveyed in this heart-on-sleeve and viscerally compelling reading. Whilst there is an unease and restlessness in the jagged outlines of the narrative, the more lyrical moments are eloquently realized. The passionate Ballada which follows is imbued with tenderness and a wistful quality. Inui and Häring let fly the aggression in the dissonance-flavoured Allegretto. The edgy mood is assuaged in a rhapsodic Adagio, and I love the way the players introduce an element of reflection into the music. This is a beautifully recorded release, the venue of the Immanuelskirche Wuppertal conferring warmth, intimacy and a surrounding space around the performers. The annotations discuss, not only the ethos behind the recording, but offer detailed elaboration of the music. On this generously timed disc these persuasive accounts set the bar high. I hope to hear a lot more from these accomplished and gifted performers.